Time is like that — both point AND duration. This is how it can bend and warp. A week, a second, a season: all are specific and discrete, but none are the same. The present can be cut to any number of lengths, from a single vibration of a quartz crystal to the display period of a digital timepiece. 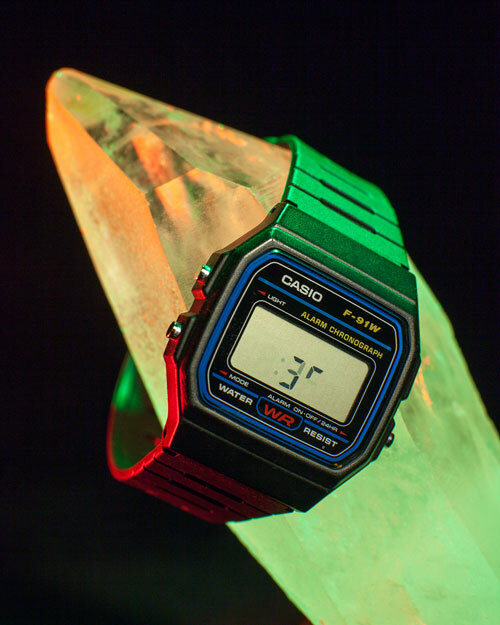 Watch Wyoscan 0.5Hz is a reverse-engineered Casio digital watch. A tiny computer inside has been reprogrammed to slowly render the current time from left to right, scanning across its liquid crystal face, completing 1 cycle every 2 seconds. You'll notice that reading this watch requires more attention than usual, as the seven segments of each digit are lit one by one across its display. This speed may be adjusted until it reaches the limits of your perception. You and your watch are now in tune.